Welcome to the St Paul’s Church website. We are a friendly and welcoming church. We hope you find what you need to know on the website. 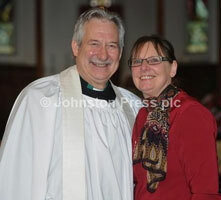 The Vicar at St Paul’s is Rev Ron Watkinson. 1869-2019 St Paul's is celebrating it's 150th anniversary - we hope that you will come along to services & special events being held during the year. Welcome to St Paul's website. As we look ahead for what 2019 will hold for us we hope that you too can look forward with HOPE for the future. Our times of worship together are held within the Eucharist service and all are welcome to the 10.30am service every Sunday and also to our 10.30am said Eucharist Service every Wednesday. Currently our Virtual Tour under the 'Our Church' side heading & scroll to the bottom, does not seem to be working correctly and so we are trying to recify that. Apologies for that. It is really useful as you can have a look at what the inside of the Church looks like, ideal if thinking of being married here. St Paul's was built in 1869 for the railway workers and was known as The Railwayman's Church' and is surprisingly beautiful inside. We are located on an island - the New England Triangle traffic Island - with Lincoln Rd on one side and Bourges Boulevard & main entrance on the other side. The church is perfect for weddings with the car park beside the church; enquiries for baptisms/christenings are welcome & the service is normally held early on Sunday afternoons. Rev Ron is available for funerals, whether in the Church or at the Crematorium. Please contact us on 314117 or email revronkingdomyouth@btinternet.com or valwatkinson@yahoo.com for any of the above or if you have any kind of pastoral request we might be able to help with. We have a loop system in the church for the hard of hearing; a car park beside the church; toilets in our Church Hall next door; coffee & tea after our Sunday morning services & after the 1st Weds in the month Eucharist. Our VISION PRAYER is said at every service: We would like to see this lovely church go on for many more years to come, filled with people of all ages; a church that is vibrant & growing in strength and faith; a busy church; a church people will be proud to call their own; a cornerstone of New England. Amen. Our monthly 'T @ 4' Church held at 4pm in Church held mostly at the end of each month (see Diary page for dates) & ideal for all who want to bring young children to enjoy some craft, with a bible story on dvd, a prayer & singing and then at 5pm sandwiches & cakes. All ages are welcome to come along. We have grandparents, parents & grandchildren! We have appointed a part-time Children & Families Worker who began in June 2016 and is getting involved with families at 'T @ 4' and also getting to know families whose children are at the Zig Zag Day Nursery in the Church Hall. The Church is in partnership with the private Nursery. In 2016 we had a grant of £5000 from the Diocese of Peterborough to kick-start the ministry of a part-time Children & Family Worker fo 2yrs. Since June 2018 we have been paying Gill through donations, specific gifts given and raising of money for this ministry. Each month, either on a Tues or Thursday we also have St Paul's OASIS Time from 2pm to 3.30pm in church (see Diary Dates or Notice Sheet). All ages welcome to call in, stay for as long as you want; have a drink & some cake; chat or share some concern you might have. As well as the 10.30am Sunday Eucharist & Weds Said Eucharist services there is an opportunity to meet with others mid week to look deeper at the teaching from the Bible. This often includes some prayer as well as getting to know one another better. Rev Ron was the Priest in Charge for 8 years here & on Sunday, January 24th 2016 he became the Vicar due to the lifting of the 1999 Suspension of the Living by the Bishop. His wife, Val, is the Licensed Lay Pastoral Minister. They, together with those on the Parochial Church Council (PCC) & other members of the church continue to seek to be relevant in the community and parish of New England and wherever God places them. If you look at our Prayer List you will see how important prayer is to us and give thanks to God for many answers to our prayers. Our weekly Notice Sheet can be found on the Notices page which will have more up to date information on & events on the Diary page. It can also be sent direct to you by email. MEN: There is a monthly Sat morning time to meet in Church for The SHED....usually a bacon butty & tea/coffee in church with time to talk. All men welcome 10-12noon. Occasional trips out. LADIES: Beginning Sat 2nd Feb you are welcome to The Vicarage for 10am-noon for 'bacon' butty or toast & marmalade to meet and chat together. Planning to meet monthly. ALPHA, a course to find out more about the Christian faith, is held regularly & all encouraged to come on one, there is always something new to learn! Thank you for visiting the St Paul's web site and do please contact us, even if just to let us know you have clicked on us ! May you know God's blessing and peace in your life. We have a Safeguarding children & vulnerable adults policy and procedures plan in accordance with the Diocesan guidelines which can be viewed here. Also everyone is requested to fill in a GDPR Consent Form to give permission for us to hold your contact details in order to email, write or phone to give you information about events, etc. This is due to legislation from the Government that came into force in late May 2018.